“Poster of the Week” Game of Thrones by HBO | What Inspires Me? Apologies to those who actually read my blog for missing the previous weeks poster post, down to a week of creative futures talks. So this week shall see two poster posts for you all to enjoy! 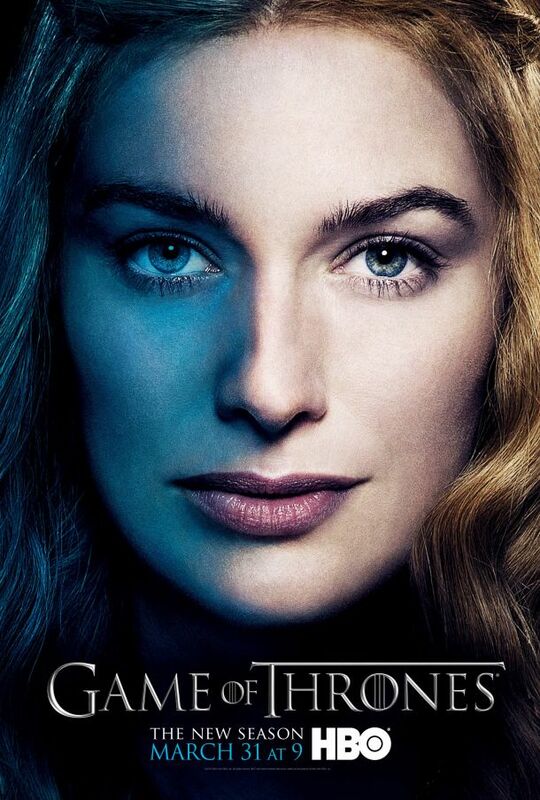 “Poster of the Week” goes to….HBO for their new release character posters for the ever so popular and desired return of “Game of Thrones”. It’s not technically in the vein of gig posters with the likes of Shepard Fairey’s and Drew Millwards work that have been seen through the last so many “Poster of the Weeks”, but I thought why not include the digitally created poster pieces. Thus I had no other choice but to select this beautifully created masterpiece and do a feature upon it before the show airs come the end of March. The collection created was to feature 12 varying characters who feature throughout the series and have become favourites of the fandom. Especially with each of the characters playing their own individual part and story in the second series that were left open, therefore hold a greater presence being upon these prints due to the importance that they are bound to bring with them into the third series. With Jon’s capture beyond the wall, Tyrions battle saving the throne for the hateful king Joff. Each poster plays a part of a much bigger and broader picture that is soon t be unveiled as the new series unfurls. I found what set these posters out as something truly great and memorable was the way in which they featured the subtle hint of blue clouding the left hand side of the characters features. To me that was almost a sure fire hint at “The winters coming” saying, with winter truly coming to the land of Westeros in the coming weeks. Its cleverly designed as to not give much away, but still lead you the audience onto speculate your own thoughts of what’s to come and how each of these characters may become affected.The blue tinge also plays well with the composition of the taken photo of the character, with it blending in well with the toned down colours of skin, hair and other features, but most of all sets out the eye colour. The eye colour I found to almost lure you in, with the boldness now centered around the one characteristic due to lack of all other colours, acting flat. The eye adds emotion to each of the prints, captivating you the audience, and still intriguing you as to what it is that could be going through their minds as captured in the photo. Its such a imaginative technique as to lead onto intrigue and wonder within fandom. Relating back to the blue as well, it in my mind almost creates a good vs evil image, or a character that has something to hide, due to half the face being covered. Conjuring up the idea of what’s this character going to do in this series, what dark consequences are going to surround them and the blue again keeping in mind what’s rapidly approaching to the north. Nothing in the image gives too much away, but neither does it allow you to simply forget what’s gone before in the past series and what clues you’ve thought up yourself. With the coming of the new series, not only has it seen a rise in popularity, its also seen more and more creations revolving Game of Thrones. Especailly with the works that Mondo has featured and put up as an exhibition, showing the great range of what there is to offer from production. With prices set from $1500 upto the dizzying heights of $15000, showing instantly the demand for such a franchises artwork and how much is actually getting produced over the series.